WITNESS the retail phenomenon! With over 10 million sold, it's easy to DOUBLE your MONEY. SEEING IS BELIEVING! 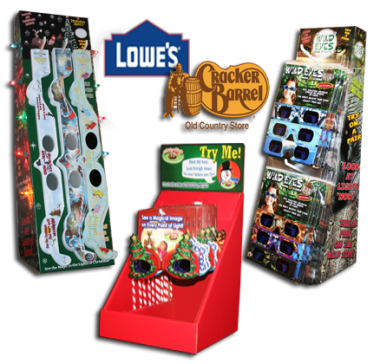 Light up your impulse sales with our amazing retail glasses. Holiday Specs™, Eye Witness Glasses™, Happy Eyes Glasses™, 3D Fireworks™ Glasses, Holiday Magic 3D Viewers, and our NEW Wild Eyes Animal 3D Glasses will boost your profit margin into the third dimension! Our holographic-effect lenses mysteriously transform bright points of light or ordinary holiday lights into magical messages delighting people of all ages. Our interactive point-of-purchase displays come complete with electric lights or LED lights attracting customers to instantly witness the mysterious illusions created by the lenses. One sale will lead to another as your customers purchase HOLIDAY SPECS GLASSES or viewers for holiday parties, stocking stuffers, and with holiday greeting cards. Holiday Specs Glasses are brilliantly printed in full color holiday designs and are available in these stock lens patterns: Snowman, Candy Cane, Ornament, Gingerbread Man, Santa, Reindeer, Snowflake, Christmas Star, Fluttering Angel, and Elf pattern. EYE WITNESS GLASSES transform any bright point of light into amazing inspirational images delighting people of all ages. Eye Witness Glasses are brilliantly printed in full color with Scripture and easy to read directions on the back. Your customers will buy Eye Witness Glasses for Sunday school, youth groups, Vacation Bible School, concerts, church camp and parties. Witness to the masses with three different interactive lenses: (Jesus, Cross, and Ichthus). Add depth to your bottom line with HAPPY EYES all-occasion 3D glasses. Happy Eyes holographic lenses create magical messages on bright points of light. Happy Eyes Glasses are a great year-round seller and terrific for holidays, birthdays, greeting cards, party favors, student/teacher gifts, and more. HAPPY EYES are printed in colorful themes coordinating with these exciting lens designs: Hearts, Happy Birthday, Smiley Face, USA, Five-Point Star, and Good Luck. 3D FIREWORKS GLASSES are a great way to make your profit margin soar with a prismatic, rainbow effect great for viewing any type of light source. Perfect for any year round fireworks event, choose from four unique stock designs: (1) Flag (2) Rainbow Spectrum (3) Stock Printed Neon and (4) Plain Neon Great for year-round sales, these specially treated multi-dimensional lenses are perfect for parties, picnics, and of course fireworks.